The Smithereens Biography, Discography, Music News on 100 XR - The Net's #1 Rock Station!!! The Smithereens' roots are anchored in Carteret, New Jersey USA, where three of the four members of this Pop-Rock group got together and formed a band while they were attending high school from 1971 to 1975. With the line-up rounded out by rhythm guitarist + singer & songwriter Pat DiNizio, lead guitarist Jim Babjak, bassist Mike Mesaros and drummer Dennis Diken, The Smithereens released their first record, an indie EP titled "Girls About Town", in late 1980. After five years of recording without any deserved success, The Smithereens had its first break with their first full-length album, "Especially For You", released in 1986 on Capitol Records. It peaked at #51 on The Billboard 200 while the first single, "Blood And Roses", hit #14 on The Mainstream Rock Tracks and the follow-up, "Behind The Wall Of Sleep", reached the #23 spot on the same chart. 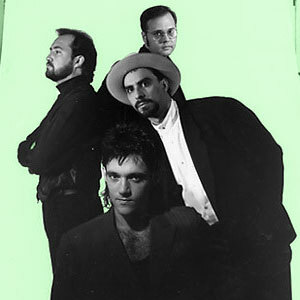 The group's sophomore effort, 1988's "Green Thoughts", picked up where their debut left off with DiNizio delivering another impressive batch of superbly constructed power Pop tunes; the opening "Only A Memory" ascended to #1 on The Mainstream Rock chart, "House We Used to Live In" peaked at #14 and "Drown In My Own Tears" netted the band its fifth Mainstream Rock top 40 hit. In the fall of 1989 The Smithereens churned out their album, simply called "11"; the disc peaked at #41 on The Billboard 200 and subsequently went platinum on the back of three hit singles, "A Girl Like You" crested at #2 on The Mainstream Rock chart and broke into the top 40 of The Billboard Hot 100, "Blues Before And After" peaked at #7 on The Mainstream Rock Tracks and "Yesterday Girl" penetrated the top 20 of that same chart. Two years later the New Jersey foursome released "Blow Up"; the first single, the string-laden Philly Soul of "Too Much Passion" not only cracked the Top 40, but it placed at #37, one position higher than their previous biggest hit, "A Girl Like You". In addition the album yielded two Rock radio hits, "Top Of The Pops" grabbed a #19 spot on the Billboard's Mainstream Rock list and "Tell Me When Did Things Go So Wrong" inched into top 30. However, when the Grunge movement exploded, The Smithereens' shiny Pop-Rock felt out of place during the early '90s and "Blow Up" failed to rise above #120 on The Billboard Top 200 Albums chart. The band returned in April 1994 with "A Date With The Smithereens"; their fifth album made a mid-chart appearance peaking only at #133 on The Billboard 200 and featured a Mainstream Rock top 20 hit, "Miles From Nowhere". Wisely, the group decided to take a break after this release. Following a five-year hiatus, DiNizio and company, resurfaced in October 1999 issuing "God Save The Smithereens", but this album was largely ignored by the music industry. Mesaros officially left the band in 2006. After two dazzling albums of Beatles covers and a critically-acclaimed interpretation of The Who's "Tommy", The Smithereens, now joined by Severo 'The Thrilla' Jornacion on bass, came back in April 2011 with an all-new album of all-new original songs, called "2011". The set includes the single "Sorry".